How many dresses is too many for a little girl? 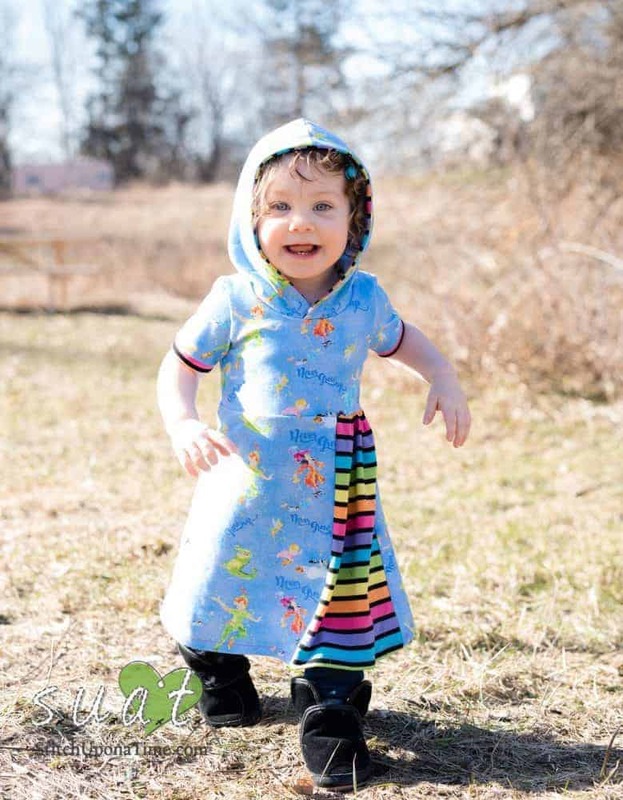 Because of the Wendybird Dress pattern, my little girl has five new dresses in the last two weeks. I’m not sure if it’s lucky or not that they grow so quickly; I’ll be sad when these are outgrown but I can’t wait for more room in her dresser for more. We happened to hit the jackpot as far as weather is concerned yesterday because it was a whopping 52 degrees! Break out the mini skirts, amIright?! So Ginnie was perfectly comfortable wearing her Wendybird with a pair of jeans underneath. And if her little ears get a chill…just pop up the hood! Oh! Did I mention that I created a hood for this beauty?! The best part is that it’s a FREE add-on for you too! I know! I’m jumping out of my seat in excitement too! All you have to do to get it is to go to our Facebook chat group and click on “Files“. 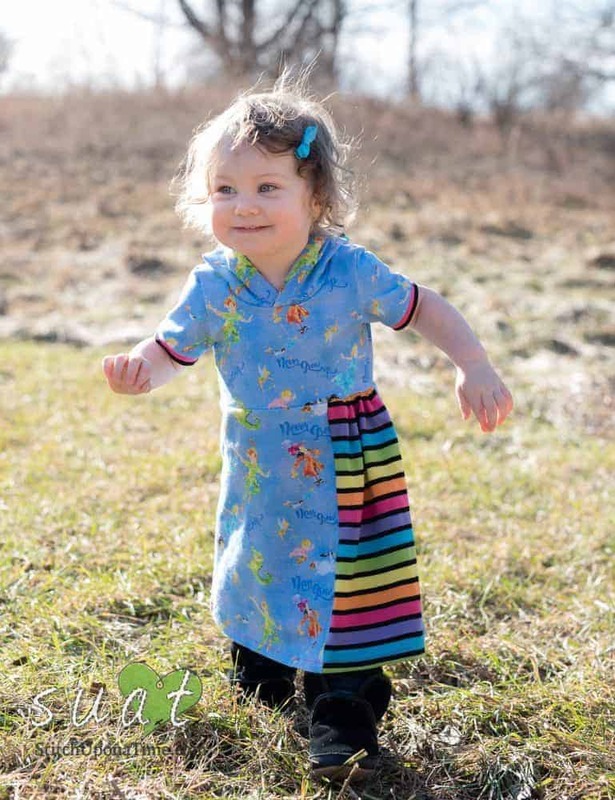 Plus, you can pick up your copy of the Wendybird Dress for 25% off now through Jan 31st, it’s already marked down! Be sure to visit all the blogs for the tour! And if you sew one up, we’d love to see you share your version in the SUAT Facebook group! Comment below with what your favorite options for the Wendybird Pattern are and one lucky winner from each blog will be announced when the tour wraps up on Jan 31st! I’ll see you in the chat group! This entry was posted in Review, Tutorials, What's New and tagged dress, gather, girl, hood, panel, pleat, Stitch Upon A Time, SUAT, wendybird. Love it with a good, and I’d add long sleeves- it’s been unusually cold in ohio this winter! Super cute!! I love that there is a puff sleeve option, and now a hood option!! Love the multiple sleeve options! Long sleeves with the tight pleats I think are my favorite to look at. And I’m going to have to try the tunic length hack at some point! Love the boat neck with bubble sleeves option! What a cutie! The dress hoodie combo will certainly keep your sweetie warm. I loove the puffy sleeve option so cute! We’re in MI too so long sleeves are a must right now. I love the contrasting panel in the front too! REgular short sleeve with gathered panel skirt. I love the little pleat in the skirt! I love the multiple sleeve options. It makes for a multi season dress. The hood adds even more fun to this dress. Having different sleeve lengths is a good adaptation for the pattern. I think it is the most useful modification. I just received my spring cotton knit fabric, so I am excited to put this together for 2 GRANDdaughters! Now they may get a hood! 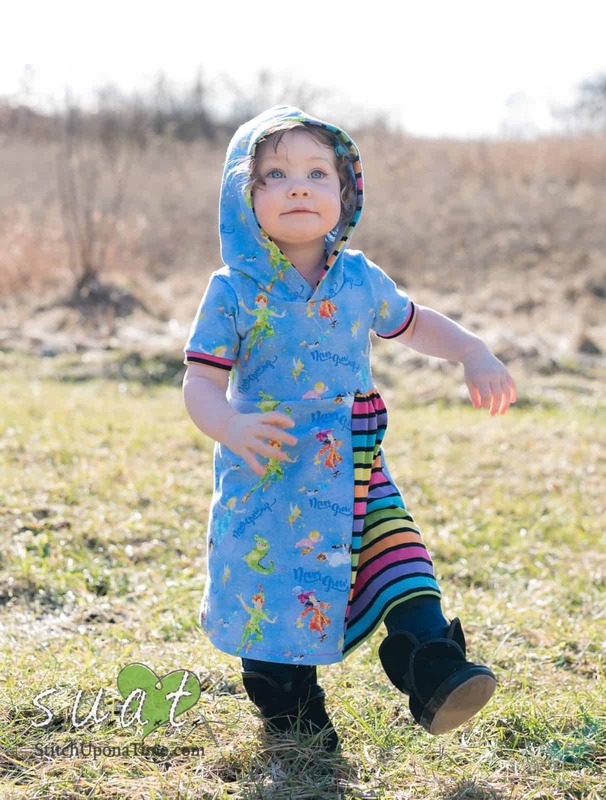 Love the hood and ling sleeve and the godet is a great way of adding a pop to it so cute. I like the hood, and the long sleeves option! The puff sleeves are so cute! We’d need to make long sleeves and hood for winter first though here. I love the hood!!! My oldest daughter has some sensory sensitivity and hoods are a huge help!!! Oh I love all the options for the Wendybird dress! 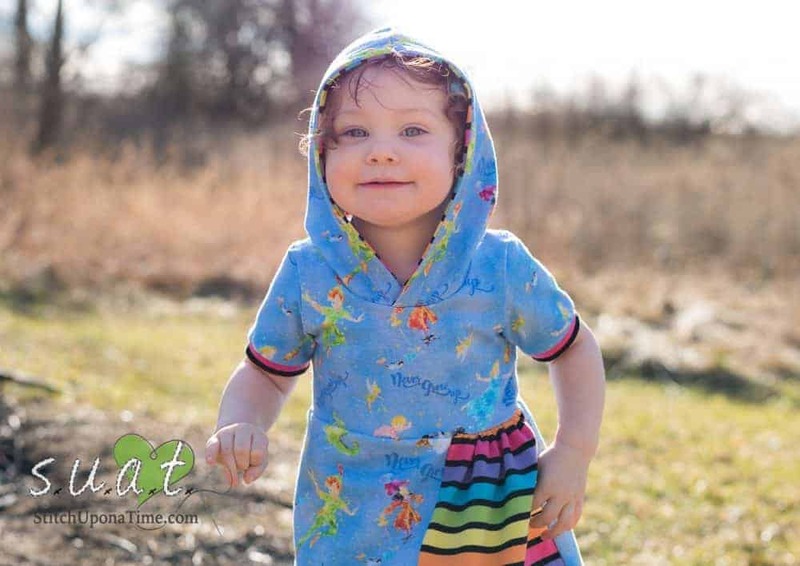 long sleeved with hood for the winter and love the cuteness of the puffy short sleeve for Summer! I will be making several, one of each option, for my grandaughter. she is only 9 months old but will be starting soon and just wait for her to grow into them!!! Thank you for such a beautiful and unique dress for our little girls! This is the cutest little dress! I love the many options…and that pleated panel is love! The hood is a nice added feature. I love the puff sleeve and hood are my faves!! I love this dress, I can’t wait to try making it and adding a hood is going to make it an excellent dress for winter. Loving the hooded option!!! 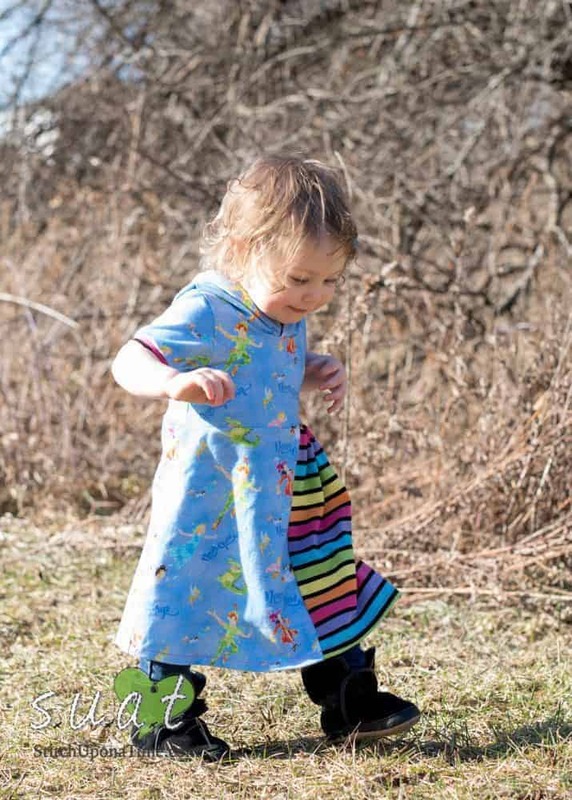 I have the Wendybird pattern and will be making it soon for my grandaughter, she is just learning to walk!!! But on second thought….. I could make a shorter, top version while she is still crawling!!! !